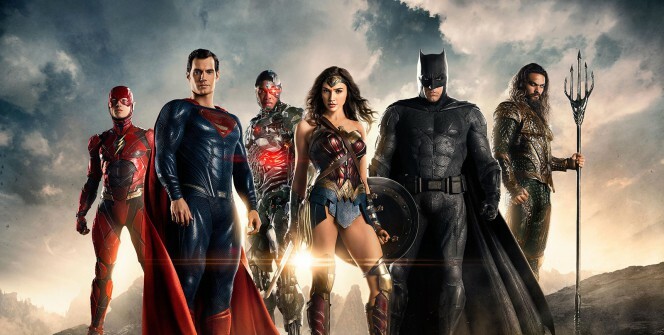 After a dismally dull experience of BATMAN VS SUPERMAN and walking out of SUICIDE SQUAD after 30 minutes, it was only my recent enjoyment of WONDER WOMAN that made me vaguely interested in seeing the new DC multi-character action film, JUSTICE LEAGUE. I'm pleased to report that, given incredibly low expectations, I actually had a good time watching the film, thanks to the fact that Superman remains dead for much of it, and the charisma vacuum that is Henry Cavill, and sheer flabby uninterested of Ben Affleck are diluted by both Wonder Woman's earnest awesomeness and a trio of great new additions to the franchise. I was genuinely amused by Ezra Miller's nerdy, funny Flash, and suspect that his character benefited most from Joss Whedon taking over the reins as director once the portentous heavy-handed Zack Snyder left for personal reasons. That Miller went from playing a genuinely unnerving psycho in WE NEED TO TALK ABOUT KEVIN to a disarmingly hapless teen here shows great range. I also really liked the teasing of a more earnest backstory involving his incarcerated father played by Billy Crudup - who manages to communicate pained selflessness in a few brief scenes. Perhaps most surprisingly, I loved Jason Mamoa's rock-star ragged Aquaman. This was a great shock after he failed to impress in the CONAN remake and GAME OF THRONES - but that suggests scripts and directors that cast him for his body and not his evident charisma and ability to turn a genuinely comic line. His AQUAMAN is an ancient hero, pissed off with the world, performing small acts of kindness while blind drunk. Insofar as he has an arc, it's realising that he has to take responsibility for saving the world and be a true heir of Atlantis. Similarly, in this film, Gal Gadot's Wonder Woman also has to assume the mantel of leadership and become an icon of hope, just as Superman had been. The final new addition is newcomer Ray Fisher's Cyborg, Victor Stone. He has the most serious role to play, as he struggles to come to terms with his powers and the role his father played in mutilating him. In the context of a rather silly film, it's his character that is the most moving. Against this cast of genuinely funny and moving characters, it was easy to quickly move past Ben Affleck's continuing banality as Bruce Wayne and Henry Cavill's po-faced, charisma-less Superman. The film falls into two parts. The first half sees Batman and Wonder Woman try to put the band together and we get actually rather elegantly concise back-stories to the Flash, Aquaman and Cyborg. We also see a world grieving the death of Superman, living in fear. This rather literally attracts a bunch of space-wasps led by a giant minotaur helmet wearing ancient evil called Steppenwolf (voiced by Ciaran Hinds - ROME). He's after three random Boxes/MacGuffins which, if put together, enable him to terraform the Earth into the Hellscape he calls home. He very quickly nicks one from the Amazons and one from the Atlantians setting up the second act of the film. This begins as the gang decide to use the third box, conveniently sitting in Starlabs, to resurrect Superman (why?!?!). But in all the chaos of the newly alive Superman getting angry at the Crew, Steppenwolf nicks the remaining box and flees to a former nuclear energy plant in Russia to host the final and inevitable showdown. The plot is evidently stupid and just a showdown-delivery device. The stakes are always so high in these franchise films you can't really take them seriously. Every acton set-piece blurs into one. I was, however, surprised at the plot echoes to LORD OF THE RINGS. The Boxes are like the Ring. They were fought over long ago. An alliance of three species - Amazonians, Atlantians, Men replace Elves, Dwarves, Men - and hidden away in secret to prevent an evil person using their power. Sound familiar? Today, the three types of people must again unite to destroy the Ring/Box itself. But within the silly plot, and the truly terrible lines, there are moments of really superb writing - maybe Whedon, maybe not? Some are the funny one-liners, but some are where they truly show an understanding of the universe they are in. For example, when Superman is resurrected they make him angry and confused so that he faces off against each member of the League. The point is to show how his powers rank against theirs, but also to show their characters too. So clearly Superman can best them all, but it's interesting that only Wonder Woman knows that she has to appeal to his heart, to his sense of family to bring him back. But it also allows one of the coolest scenes in the film - where for the first time Flash encounters someone that can match his pace. The scene where Superman turns around to look at him in "flash" time is one of the most chilling in the piece. Sadly the movie doesn't maintain that tone and goes back into a kind of wannabe Marvel witty banter mode. JUSTICE LEAGUE is rated PG-13 and has a running time of 120 minutes. The film is on global release.